Push technology is a model of Internet-based communication in which information transfer is initiated from a server to the client. Also called the publish/subscribe model, this type of communication is the opposite of pull technology in which a request for information is made from a client to the server. The information that’s sent by the server is typically specified in advance. When using Streaming API, you specify the information the client receives by creating a PushTopic. The client then subscribes to the PushTopic channel to be notified of events that match the PushTopic criteria. In push technology, the server pushes out information to the client after the client has subscribed to a channel of information. In order for the client to receive the information, the client must maintain a connection to the server. Streaming API uses the Bayeux protocol and CometD, so the client to server connection is maintained through long polling. The Bayeux protocol and CometD both use long polling. Bayeux is a protocol for transporting asynchronous messages, primarily over HTTP. There is nice jQuery plugin available on web which implements Bayeux protocol and CometD. 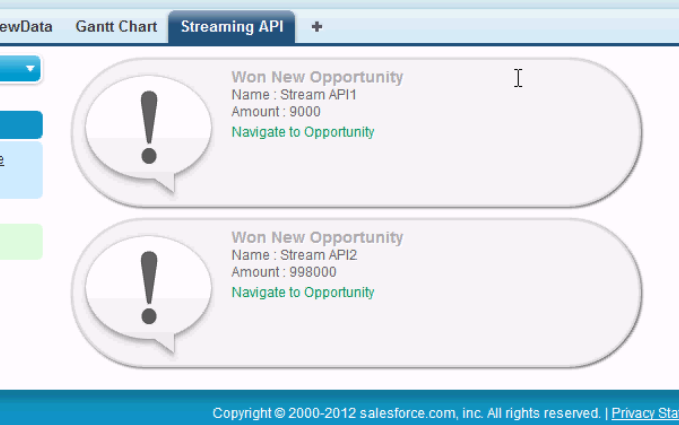 Navigate here for Salesforce documentation for Streaming API. Event : Either the creation of a record or the update of a record. Each event may trigger a notification. Notification : A message in response to an event. The notification is sent to a channel to which one or more clients are subscribed. PushTopic : A record that you create. The essential element of a PushTopic is the SOQL query. The PushTopic defines a Streaming API channel. I want notifications about all opportunity whose status is won. First step to implement any streaming API is to create the Push Topic, which is going to subscribed by all the clients. To create PushTopic, we will need the developer console of the Salesforce and assume that the name of the topic is “WonOpportunity”. After saving this page, open same salesforce instance in other browser or tab and make change to any opportunity with status “won”, it will display an alert that opportunity is won. following JSON response we gets from Streaming API. The Rows returned in Object depends upon the Push topic create earlier. We can use “firebug” plugin of Mozilla to check whether the http request is made or not from JQuery (comet). Following screen can give you little idea about the http (XHR) requests made from JQuery . Hi, Excellent blog. The code works fine in a visual force page, but it does not work in visual force TAB. Do I need to make some specific changes to make it work in visual force TAB? Hi, do you think this work in salesforce1 to made a notification like puch notification? if not, do you know something to do that? Yeah, It should work but user needs to stay on that VF page. What will happen if user navigates to a different page? Will the connection timeout? If yes, can I capture the timeout and reconnect again when the user comes back? If navigation is changed and next page also implements streaming API then it will work normally but if next page does not implement streaming API then no one will be subscribing API so it will be ignored. Great Article. I am facing one issue though. Kindly refer to the attachment. I have subscribed to changes to Contact Object from my vf page. As seen in attachment , I have Cases open which is basically the same vf page which has subscribed to cometD. Now when the callback is received it is received across all the Case (encircled in Blue) . How do i prevent this . Your post is very nice & worthy.But i setup everything as per your post.But i am not able to get any pop notifications.Even errors also i didn’t get it. Best post it is working accurately but i got notifications only in vf page.But if you enable it chrome or other browser notifications it would be really nice.